I have been wanting to try making cookies with a mold for a long time. So the understated sugar cookie got a makeover at my house this week with a sunflower baking mold from my sponsor Wholeport. I really loved how these cookies turned out! Talk about elegant and something new at the holiday table, these were perfect! I used my long time favorite sugar cookie recipe from Martha Stewart with a few changes I have made. Sift together the dry ingredients. In an electric mixer, cream butter, sugar, until well mixed then add the egg, Kahlua, and vanilla and continue mixing until light. Add the dry ingredients a little at a time and mix until well blended. Wrap and chill dough for at least 30 minutes. You cannot skip this step, with the mold you must chill the dough. Preheat the oven to 400 degrees. The cookie mold design, the holder it fits in, the rolling pin, the work surface all must be lightly floured. All work surfaces must stay lightly floured between each cookie. Roll out the dough to about 1/8 and inch. When you insert the design disk in the baking mold holder and press down, press hard with this handle I am holding onto in this picture and give it a tiny twist, like you are making biscuits. Make sure you have gotten to the work surface with your effort. Then push down on the spring loaded handle to make the cookie design, pressing hard. Place your cookies on a parchment lined baking sheet and bake for 6-10 minutes. It is not recommended to get these cookies to brown. Okay here is my first tray of cookies. You can see that with some of the cookies I pressed hard enough to create the design and with some I didn't. So press hard to make these cookies. After this tray I was getting the hang of it. Here they are right out of the oven! Aren't they gorgeous with this design pressed in them! I just love how they turned out! With this recipe they are crispy on the edges and soft in the center a great texture in a sugar cookie. Here they are ready for a cup of tea and some guests! I really loved this baking mold from Wholeport! Thank you Wholeport for sponsoring this post by supplying the baking mold! I am so happy to join Marty, Holly, and Amy for our first holiday party! 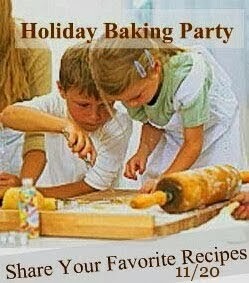 The Holiday Baking Party! Those are beautiful! What a wonderful idea. These are just gorgeous. I need a mold like this. These are SO pretty! Do they have other molds? The recipe looks good, too. How can you go wrong with Martha!! Jane they do make several more of these molds. The link will take you there. Yes please, I'll take a couple! What gorgeous cookies, Sherry! They look so pretty on your blue and white plate. Thanks for sharing them at my HOME. Oh! They are too pretty to eat, but who could resist? We love sugar cookies here too. Your mold is pretty awesome! Sherry, You are so creative, the cookies look too pretty to eat. I love all the features this week too! !